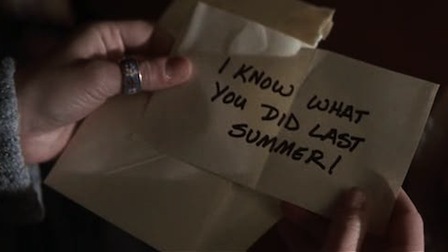 When I Know What You Did Last Summer came out it gave pause to many a teenager (and gown up) that had ever done something wrong (of course not to the extent of the characters in the movie, but still). The idea that someone may know what you’ve done and be able to track you down can be a chilling idea, but for marketers it is the holy grail. I’ve talked about the idea of targeting people when and where they are, especially as it relates to how I want to be targeted, on my terms. I’ve always loved the idea of being able to walk into a store and get a text message saying, “hey we see you are looking at those new shoes, how about we offer you 20% off if you buy those size 7s right now.” I remember working on similar initiatives back in the 90’s with context sensitive selling, which has now become marketplace, but it’s still pretty generic, but that’s all starting to change. With augmented reality becoming more commonplace and companies focusing on distilling unstructured, big data, down to things marketers can use, my hopes aren’t too far out there. And now I’m looking at companies like PlaceIQ that are taking all that unstructured data about people and what they are doing and turning it into info that marketers can use to determine the best way to target people and market products. And now we are seeing companies like Apple realizing how to get into this game. With their purchase of WifiSlam, Apple is betting that they will be able to work with big data companies to be able to track people inside stores and venues and sell to them on the spot. As we go further and further into this brave new world, we will really realize that marketers will always know what we did yesterday, today and even the possibility of our plans for tomorrow. Does your brand suffer from multiple personality disorder?